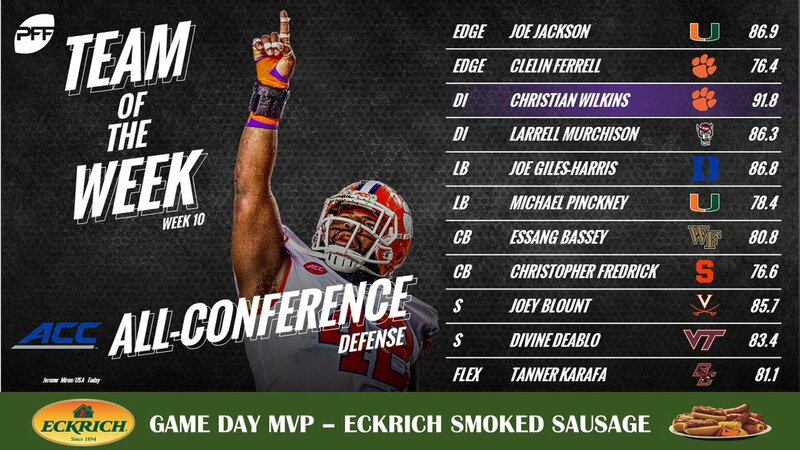 ProFootballFocus released their Week 10 ACC Team of the Week, and 3 NC State players were represented for their performances against Florida State. Redshirt Junior Jakobi Meyers was the highest graded wide receiver in the ACC in Week 10, grabbing 9 receptions for 125 yards and a touchdown. Ryan Finley’s passing efficiency rating when throwing to Meyers was 144.3, which was the second best mark of the week. This is Meyers’ 3rd PFF weekly honor through 7 games this year. Redshirt Senior Left Guard Terronne Prescod has been insane this year, earning the PFF weekly honor in 5 of the 7 games he’s played in. Redshirt Junior Defensive Tackle Larrell Murchison picked up his 2nd PFF weekly honor for his performance against FSU. He grabbed the 1st interception by an NC State defensive tackle since 2009. Even though he didn’t make the weekly team, Redshirt Graduate Ryan Finley was the 2nd highest graded quarterback in the ACC in Week 10. 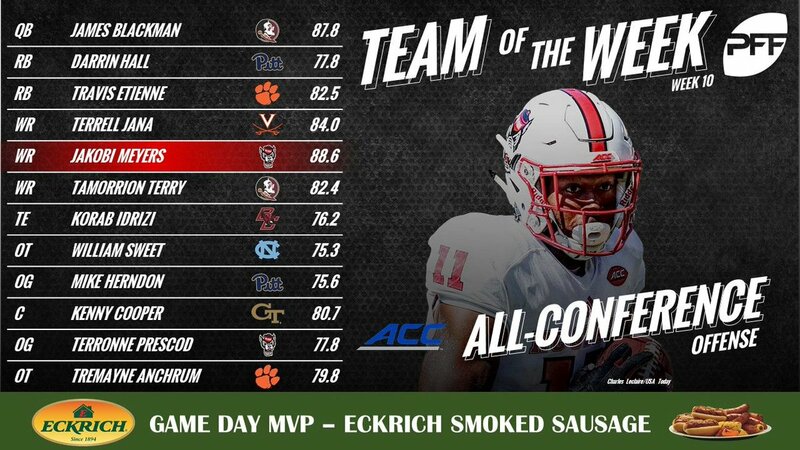 Also, Senior Reggie Gallaspy and Freshman Ricky Person didn’t make the team either, but they were 2 of the 5 highest graded running backs in the ACC this past weekend.